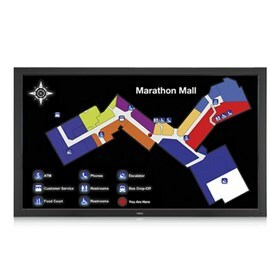 The NEC V652-TM is a 65" LED display that offers digital signage users touchscreen capabilities. This display has 1920 x 1080 resolution that displays incredibly clear imagery and features optical-imaging technolog that allows for up to six simultaneous touches. The LED backlighting allows for reduced power consumption while the carbon footprint meter enables responsible use of the display conserving green gas emissions in real time. The V652-TM high-performance panel and abundant advanced technologies promote extended use, making this display ideal for corporate, retail, restaurant and wayfinding kiosks. The panel is protected by its anti-reflective glass coating and allows for higher brightness transmittance. The built-in speakers enhance the visual experience with superior sound. The NEC V652-TM has many exciting features for users of all types. See the NEC V652-TM gallery images above for more product views. The NEC V652-TM is sold as a Brand New Unopened Item.